What's the best way to invest to have financial freedom in 10 years? If you wish to attain a state of financial freedom for yourself and your family in the next 10 years then you must have a clear and disciplined approach towards your financials right from the present day. Everyone wants to be financially free and secured at one point of the time or other. 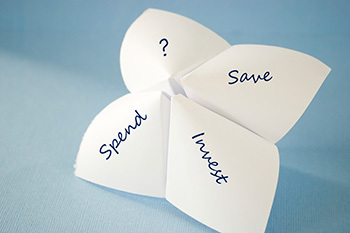 It depends on you how early you want to attain your financial freedom. Financial independence and financial freedom are two different states and one must be able to attain both for a financially secured future. What are Financial Freedom and Financial Independence? You are in a state to afford more than your current lifestyle and are working at your wish. 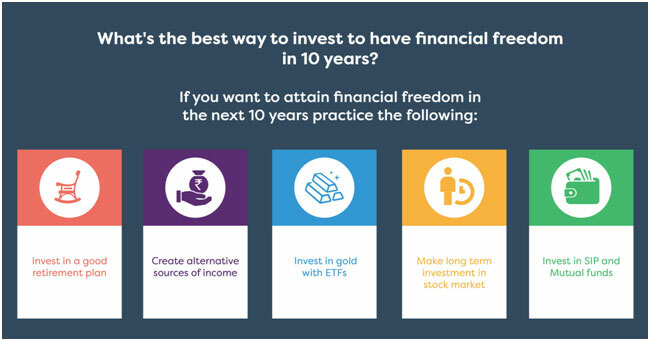 How to attain financial freedom in the next 10 years? Investment in Real Estate: An investment in real estate with a few good properties can be very fruitful in the long term. To have better returns with a small investment you can invest into properties located in a good locality in tier-two tier cities. With the upcoming development, you can buy these properties at a much lower rate initially which would turn out to be very worthy with the passing years. Moreover, you can always have the privilege to have a stable rental income from these until you either sell them off or bring into personal use. Alternative sources of income: An alternative source of income now will add up to your wealth which could either be used into investments, personal use or savings. This will help you in getting financially stronger. Investment in good retirement plans: If you start investing in good retirement plans from now itself, it will guarantee a stable monthly income upon retirement. This will make your retirement easy. Long-term investments in the stock market: Long-term investments in stock market yield higher returns. These investments are made by analyzing business and not the stock prices. Long-term investments in a diverse portfolio reduce the risk and result in higher returns at the same time. Investment in mutual funds and SIP: If you invest in different types of mutual funds like Debt funds, Equity funds and Hybrid funds with a proper balance, it will result in higher returns. This totally depends on your risk appetite and preferences. But make sure you in diverse assets to get more benefits. Another way of investing in mutual funds is SIP (Systematic Investment Plan) where you invest some money every month in funds. SIP works by averaging the per unit price of the stock. Investment in gold: You can invest in gold by the traditional way of buying it in physical form. But another way in which you need not take care of the physical form yet you can invest in gold is ETF. ETF or Exchange Traded Funds are similar to mutual funds but they invest in gold only. With the ever-increasing demand, gold investments can be very beneficial in long-term. With the above investments made strategically in a disciplined approach will help you to attain financial freedom in another 10 years. So start from today and happy investing!